Space, the final frontier. This is not about the famous line from Star Trek but rather about how disabled bodies are devalued. Our built environment is designed for people who are bipedal. This is reinforced every time I leave my home. Last weekend it was a lack of space between tables at a local diner. This is the norm in most owner operated restaurants--tables are far too close together for any person who uses a wheelchair to easily navigate. I get it; restaurants need to jam as many tables and chairs so they can be profitable. To avoid narrow aisles and over crowding I eat at many national and mediocre big box restaurants. The national restaurant chains are more likely to adhere to the ADA. It is far more likely that I can use an accessible bathroom. It is also more likely I can access multiple tables without asking diners to move because the aisles are wider. The lack of space is something I think about every single time I go out to eat and attempt to access a larger venue. Restaurants, school auditoriums, civic centers, professional sports stadiums, small town theaters, courts, office buildings, airports, bus terminals, small hotels, bed and breakfast, and museums all too often present architectural barriers. I often wonder what do designers think when wheelchair access is required. The human element is certainly not considered. Instead, I think too many designers perceive wheelchair access as a waste of space. Simply put, access is a problem and by extension those who use a wheelchair are a problem. I am not a problem. The constructed environment is the problem. Just today a fellow member of the Not Dead Yet board, Carrie Ann Lucas, was deemed a problem. She attended a Colorado University football game and at one point risked arrest. Many huge stadiums are wheelchair accessible in name only. My favorite example is the University of Michigan's Big House. Prior to its renovation in 2007 had about 88 handicapped seats in a stadium that held over 100,000 people. The university did everything it could not to comply with ADA. This is a repetitive pattern that has not abated. Attending most large sporting events is problematic. This weekend Carrie was deemed a fire code violation. Carrie is not a fire hazard. Carrie is a human being. People with a disability are often told they are a fire hazard. The litany of lines used to exclude are plentiful: "I am sorry you can't enter the building", "You cannot sit in the aisle", "You cannot wait there". As a young man I was often told "You cannot board this plane because you are a flight safety risk". In NYC I have been told "You cannot enter this restaurant", "You cannot get on the bus the lift is broken", "You cannot enter the school because no one has the keys to the accessible entrance". I quickly learned you cannot was followed by rationalizations such as "we are concerned for your health and safety". I know I am screwed when my health and welfare is a biped's primary concern. The most officious were pilots in uniform, largely male, and state with 100% certainty: "You are a flight safety hazard". NYC bus drivers were mean; school teachers were the most narrow minded. Virtually none acknowledged the fact I was a human being. Countless bipedal people think they have power over a person with a disability. I have had ushers at Madison Square Garden tell me where to sit in handicapped seating. Some of MSG employees have threatened to evict me because I am not exactly in the indicated location (I am referring to inches). This is merely an assertion of power. It has nothing to do with access and is instead a humiliation ritual. My point is when disability enters the question of space bipedal people don't get it. All they know is they have power and we people with a disability do not. Hence Carrie's being deemed a fire hazard is worn out ploy used to exclude. The law states large venues must have dispersed seating but this is often ignored. The norm is for handicapped seating to be jammed in the least desirable location. I call this the disability ghetto in honor of Harriet Mcbride Johnson. In Carrie's case handicapped seating is only available in the end zone behind the marching band. I cannot think of a worse location to watch a football game. 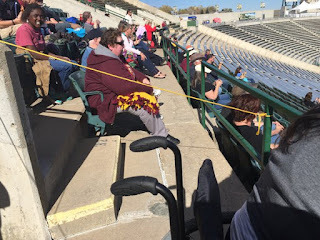 Space for people with a disability to observe an event is not valued. 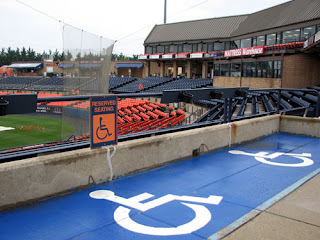 Oh, handicapped seating exists but is consistently located in the worst possible location. 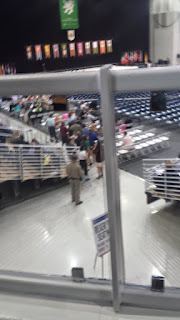 This was my view when my son graduated from college. 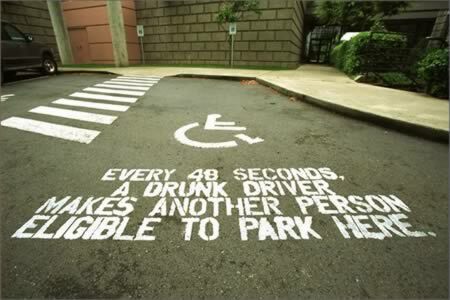 Handicapped parking accompanied by objectionable and inappropriate statement. Obviously people with a disability travel in packs and have no bipedal friends. I suppose we cripples also like to conglomerate in one location. The forced segregation of handicapped seating at large venues was addressed by the ADA. Dispersed seating is the law of the land. Dispersed seating is rare in my experience. Rare in that someone put thought in the seating area and the experience of attending an event. How does one enter and depart the venue? Are all public areas accessible if the patron wanted to walk around the venue? Are there enough toilets and perhaps a so called family bathroom. Do food vendor locations have a lower counter? Does one enter via elevator or lift? If so is lift filled with mops, buckets and trash? It is the absence of thought that is the real problem. As my son told me long ago, no one cares about access. He is correct. Our space and existence is not valued. The ADA is an inconvenience. It is an unfunded federal mandate. Oh my, I hear that one often when dealing with people in health care industry. At issue is quality of life. I think no one should consider sitting in the center of a theatre a "luxury" Americans enjoy. These words were penned by Dave Hingsburger, a Canadian, at Rolling Around in My Head". http://davehingsburger.blogspot.com/2015/10/being-seen.html His touching post made me think. Will I live to see the day when I can just go out. I am never able attend a public event without much thought. How can I get in? Will it be so crowded I will be miserable. How long will it take me to contact someone and purchase tickets? For example, I wanted to attend opening night for the Syracuse Crunch, the local AHL minor league hockey team. Unlike bipedal fans, I cannot order tickets on line. I must contact the box office that according to the website enables them to provide superior service. This supposedly superior service does not include returning three phone messages. Unable to contact the box office on four consecutive days I did not attend opening night. This passive discrimination is common. Like being deemed a fire hazard, the superior service is in fact a form of exclusion. In short, Carrie's experience hit a vein. I feel for here. I have been in her position many times and I know all too well that her memories of the game might be complicated by the knowledge her existence was a problem. Her life was not valued. She was supposed to enjoy a football game not be subject to social denigration. I worked briefly for UMich. My favorite part was the handicapped parking. 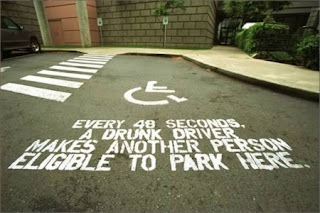 Do you know what UMich thinks those blue lines on the sides of handicapped parking are for? SNOW DEPOSITS. I went grocery shopping today. They're overhauling the parking lot of the fairly large store I went to. They blocked off a sizable chunk of the front of the lot, which reduced the number of handicapped parking spots from 12 to 4. I tried to talk to the store manager about it. I wanted to point out that they were required to make up the spaces, even with temporary signs. Every time I approached the manager he had somewhere else to be. I have been thrown off public transport for -my cane- being "in the way." I have tried to navigate sidewalks with a mobility scooter where the kerb cuts were clearly not designed for mobility devices. Or sometimes they're in front of a drain opening, or the road below them is damaged, or they're otherwise inaccessible. I've had to ride in the street because someone decided to park on the sidewalk for "just a minute!" I am disabled. I am a non-person. Moose, I will readily confess that there are days I too feel like I am a non person. Some says I do not leave my house for this reason. Thankfully I do not succumb to this often as it could easily become a vicious cycle. A healthy dose of anger can be empowering. It's infuriating when the accessible places we did have, which were built to real accessibility standards, are degraded or destroyed. For example: ADA requires that customer service counters have at least one station at seated height. Many of the stores in my town have used that lowered counter as a handy place to display info and products like brochures and lottery tickets. When the lowered counter is clear for a seated or short user, it's usually not staffed. But that should be the FIRST station staffed, since everyone can use it. Health care is a particular problem because they believe high counters solve HIPAA requirements (no, they don't). ADAAG requires at least 24 inches of space on the latch side of a door, so a chair user can angle themselves in to pull the latch. I can't count how many public places use that space for a signboard or a decorative lamp/flower arrangement/building directory. So many fought so hard, it was constructed correctly, and humans have chosen to reduce accessibility. When I see these things I get the message: I'm not welcome.